Between the Alps and the Po Valley, about 65 m above sea level, the lake is located in the north in the region of Trentino-Alto Adige, to the west of Lombardy, Veneto in the east. Thus, the three provinces of Trentino share (north), Verona (east) and Brescia (west) administration. The apartment TOP08 (approx 50 sqm) suitable for 2-4 persons and 1 to 2 small children, is part of the resort "OASI DEL GARDA" and is located in a quiet resort with swimming pool and large park around it. This apartment consists of a wide living room with fireplace, sofa bed and kitchenette, 1 double bedroom + 1 smaller single room incidentally suitable for children, 1 bathroom with shower and toilet, private and completely umgezäuntem garden, satellite TV, Internet Wi-Fi. The apartment is further furnished with great care - see below "TOTAL EQUIPMENT" - and is just a few minutes drive from town centers Monzambano and Peschiera del Garda. 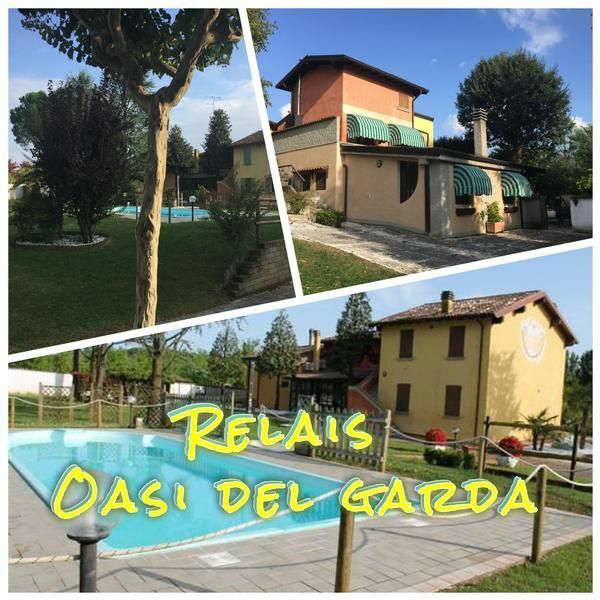 The resort "OASI del GARDA" or Garda oasis, a newly refurbished resort from a total of 3 small buildings is composed, with private swimming pool, eigezäuntem Park and large outdoor barbecue. This exclusive resort is located in the beautiful Moränenhügelland near the southern lake, on a 4,500 square meter property. All apartments have private entrance and a cozy living room with kitchenette, 1 to 2 bedrooms, bathroom with shower and toilet. You are on the first floor or the ground floor and are equipped with terracotta tiles. The swimming pool at the "Oasi del Garda" is open May to September. Our guests also include a communal washing machine, an outdoor barbecue area, a giant garden with children's playground and Internet Wi-Fi for free use. The Peschiera del Garda on the lakeside is a 10-minute drive away. Freedom, space, peace, only about ten minutes away from main cities of Lake Garda Desenzano, Sirmione, Peschiera, there are only about 30 minutes to the famous cultural cities such as Verona, Mantua, Brescia. Even Milan and Venice are easily accessible in a day. Amusement parks such as Gardaland, Caneva World, or botanical garden SigurtÃ Park, the largest in Europe, is also located in the immediate vicinity. The kitchen has all appliances: toaster, coffee maker, kettle, also cutlery, glasses, plates, cups, etc. Well behaved pets welcome (please specify exact size). SEA BEACH (stone beach): approx 9.0 Km. DOGS BEACH: approx. 9.0 Km from our apartment was opened in 2011, a beach on Lake Garda for dogs. Here are allowed out our 4-legged friends for a swim. SAFARI PARK NATURA VIVA 15 Km. THERMAL PARK in Cola LAZISE at 12 Km. AQUA PARK "CANEVA" in Lazise 13 Km. Peschiera del Garda on the A4: 10 Km. Verona Catullo about 30 Km. Brescia / Montichiari about 50 Km. Milan Malpensa Airport is 170 Km. Pet: per object and day Costs amounting to 6 EUR (Mandatory). Monzambano is a northern Italian town with about 5,000 inhabitants in the province of Mantua in Lombardy. The community is directly adjacent to the provinces of Brescia and Verona. Mozambano not one of the top vacation destinations on Lake Garda. Despite this, or perhaps because of the medieval town south of the lake is worth a visit. This is due not only to the medieval town architecture, complete with castle in the middle, but also to the wonderful wines that are vinified around Mozambano at the Mantuan wine road. Pure pleasure is so popular. For to fine wines good food is just as much as moody atmosphere, as in the beautiful grounds at the Mincio with the large dam in Valeggio sul Mincio and the magnificent Castle Castellaro Lagusello. One feels almost like in Tuscany, in the evening when the crickets sing their song and you can enjoy a romantic dinner in the moonlight and candlelight. Mozambano is just a stone's throw from Sirmione, Peschiera or Desenzano. Peschiera del Garda is an Italian town with almost 10,000 inhabitants on the southern shores of Lake Garda; it is located in the province of Verona. right on the river Mincio. Parts of the old town with its fortifications separate the place from the mainland. The place has a small marina, a train station and is a site of the Italian army. Peschiera is not a traditional tourist destination and therefore has much evolved structures. More recently, but is also of tourism on the rise. Market day is Monday. Nearby Cities are Brescia and Verona in the west to the east. Peschiera del Garda is part of the Lugana wine region. Air condition (per property and day, included in price 5 EUR).